Drink plenty of water each day, they say. We have heard it a million times, yet around 70% of us still struggle to take on this good advice. Water is a basic necessity needed to maintain a healthy body, a clear mind, and a good balance within our tissues. And I know that 97% of beer is water but beer will not count into your daily water intake. So let’s see how we can really increase our water intake and why it is crucial to do it. – Carrying vital nutrients all around the body where it’s needed. – Lubricating by forming the base of saliva and fluids surrounding the joints. – Body temperature regulator with perspiration. – Picking up all the leftovers, wastes and debris that the cells throw off into the lymph system and transporting them out of the body via the channels of elimination. – Helping the kidneys function at their best by eliminating debris that can cause kidney stones. There is a wide range of suggestions on how much water we should drink each day. The famous 8 glasses a day is now outdated. Every one’s intake needs is different and should be calculated according to weight and activity levels. The easiest and best method is to take your current weight in pounds and divide it in half. This is your magic number, in ounces, of water to drink each day. For example, a woman weighing 130 pounds should drink 65 ounces or 1.9 litre of water each day. This amount needs to be increased by 12 ounces or 350 ml for every 30 minutes of training. What are the consequences of not drinking enough? Not drinking enough water can lead to dehydration. 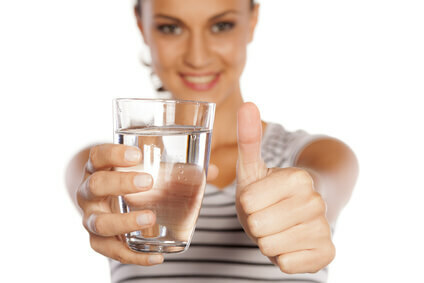 Early signs of dehydration include increased thirst, dry mouth, sticky saliva and reduced urine production. It can also cause a lack of energy, dizziness, difficulty to concentrate and headaches. A body lacking water can produce a feeling of being hungry. Dehydration can mimic hunger in a desperate attempt of getting fluids via foods. Therefore, it is important to drink water when feeling hungry to reduce the risk of dehydration and avoid unnecessary food intake. This can therefore also be a helpful tip for weight control. How can I achieve my daily water intake? Here are a few tips to help you reach your daily water intake, making it easy and enjoyable. This can be as simple as a little piece of paper on the fridge, or a page in your day planner. Just make a little checkmark, or dash on the piece of paper every time you drink a glass/bottle of water. The log will help you keep track of how much water you have had on any given day. If you tend to get bored with drinking just plain water, change things up and add a little flavour by adding a dash of lemon or lime. You can also try some other fruits, vegetables or even herbs (cucumber and coriander water is amazing and has some great healthy benefits as well). Don’t be afraid to experiment! Put an herbal teabag into a bottle of water and let it sit in your fridge for a while. It will give all kinds of delicious flavours to the water. The best thing is you can choose the herbs for their natural benefits. For example, use chamomile in periods of stress. You can achieve 2 goals at once: keep hydrated and reduce your stress! If you are craving the bubbles of a soda, try soda water. Again, you can also add a splash of fruit juice to make it extra special. Broth and bouillon are a great sneaky choice for fluid intake. Try it on a cold winter day and you will be addicted. It’s much easier to drink water when you have it readily available. Carry a bottle of water around with you in the car, at work, while running errands, in the yard, and even while you are working around the house. You will be sipping away the water without even noticing it. Share your tips and recipes that make your water intake easy and delicious.